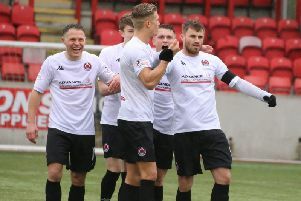 Kilsyth Rangers went out of the New Coin Holdings West of Scotland Cup as expected on Saturday when they were beaten by Beith. But while the Premier Division side’s 4-2 success was no great surprise really with an evident gulf in class between the teams, the third round tie was a pretty even contest up to half-time. Thereafter it was all one way, although in fairness Rangers were missing several players with Andy Carlin and Chris Reid unavailable and Paul Doyle cup tied with Rutherglen Glencairn. Rangers had the benefit of kicking down the notorious Bellsdale Park slope for the first 45 minutes and they started well, making a couple of decent chances in the first few minutes. They went ahead in the ninth minute when Joe Barclay cut in from wide right and shot home. But a minute later they suffered a blow when Michael McGee went off with an ankle injury, his place being taken by Damon Welsh. And within another minute Beith - already through to the last eight of the Scottish Junior Cup and looking to make the same stage of the West - were level when Darren Christie scored an almost identical goal to Barclay’s. But despite their First Division status Rangers were still the more dominant side and retook the lead not long afterwards. This time it was Paul McBride who finished off a good move which also involved Nicky Prentice and Barclay. There was a lot of good football on show from both teams but Rangers still held their 2-1 advantage going in at the interval. However Beith now had the slope to their advantage and soon made it pay to devastating effect. Kenny McLean levelled matters with a fine goal within five minutes of the restart and not long after Paul Frize put the Ayrshire side in the lead when ’keeper Chris Prior hesitated in going for a ball. McLean then got his own second goal and Beith’s fourth just on the hour mark to end the game as a contest. Thereafter the result was never in doubt although Rangers did have some chances. In one short period of real pressure they had at least four or five shots blocked or cleared in a big scramble in the home goalmouth. But Beith were always comfortable though and also missed quite a few chances of their own as they saw the game out to book their place in the quarter-finals. Near the end the visitors were reduced to 10 men as Paul McBride saw red when he disputed a referee’s decision a little too forcibly. In the end it was a disappointing day for the fans who made the journey to Ayrshire, but at least the weather was vastly improved from recent weeks. Kilsyth: Prior, Waters, K McBride, Hamilton, Hughes, McGee, Livingstone, O’Neill, Barclay, P McBride, Prentice. Subs: Welsh, Pearson, Nash, Hogg. Beith: Grindlay, Ryan, Docherty, McDonald, Sheridan, Martin, Christie, Frize, McLean, McGowan, Burke. Subs: Wilson, Reid, McArthur, Clark, McGregor. Rangers resume their league campaign on Saturday at home to Maybole, kick-off 2pm.